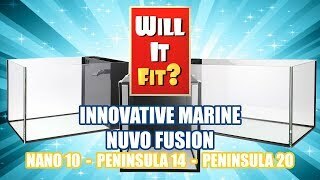 The Fusion Peninsula 20 combines beauty and function in a one-of-a-kind AIO (all-in-one) nano aquarium. Built with 8-mm low-iron glass and black silicon, the aquarium is crystal clear. The flat polished and diamond-ground glass edges make the aquarium a work of art. Inside the aquarium you’ll find a high-performance internal filtration system. The black acrylic wall with an overflow that skims the water surface. A pre-molded micron filter sock captures fine debris, keeping the water clean and clear. An adjustable return flare nozzle let you direct water movement anywhere inside the tank. A 211 gph submersible water pump is included. The filter system has built-in chambers to add a submersible heater and a Ghost Protein skimmer. You can even add an Innovative Marine MiniMax Media Reactor for chemical filtration. A Skyye Light LED fixture can clamp onto the Fusion Lagoon’s rim to illuminate the tank. This is a true plug and play system! Top-quality glass with attention to fit and finish. Integrated filter system with plenty of room for a skimmer, heater, etc. 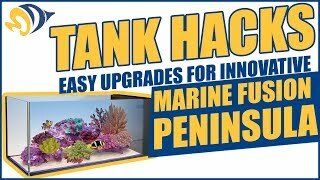 You’ll need an aquarium stand and Innovative Marine has made it easy! Your Fusion Peninsula comes with a rubber self-leveling mat that fits in between the tank and stand. The Innovative Marine stand is made of strong aluminum with anodized wood-grain finish. The stand locks together without tools. Dimensions: 12" x 30" x 13"
Filter: Internal with chambers for heater, skimmer, etc. Measures 24" x 20" x 36"
This tank is amazing! 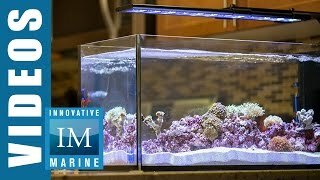 It has a nice build quality and allows for many different aquascapes. The filter area is plenty big for a small tank. No lid or screen for the top. Have to buy a make your own kit $40 +. Very nice Aquarium but did not have lid or screen for the top. Have to buy a make your own kit $40 plus.